Actually, We have got list of servers for Android which is working and also tested some DNS for our IOS friends, We don’t have a testing device for IOS, We didn’t tested it properly. However, Some of them might be laggy buut working, Just follow the steps mentioned below and you will do good with Clash Royale Private Servers. There are some good things added in these servers. All Legendary and New cards unlocked. You can make your own Clan. So, These are the special things added, I am going to post the download links below and I will tell you the procedure, How to make it work. We have collected some servers and are listed below. After downloading follow these steps. Do a clean installation of the APK. Make sure you have proper working internet connection. Pick your name and just enjoy the game. Based on my observations, These servers work only 5-6 hours per day. Major sucess rate was 1:00 – 3:00 PM IST. I will upload the new working one in next update. IOS users, You guys just need to change the DNS, Its geo-based servers, You have to change locations, According to your locations, Follow the steps carefully. Then use the following DNS adresses based on your location, It will vary. Now Turn off and on the Wifi, To make the DNS for complete change. If it doesn’t work, Just don’t give up, Keep on trying, It didn’t worked at the first time itself for me. These servers can make you feel like in paradise, Because of unlimited stuffs, I would advise you to practise alot and get well trained in the private servers, And boost your skills and rankings in the official servers. Thanks for reading, Do subscribe for more articles, Upcoming in future, If you have any problem, Please let me know in the comments. Also check the video, A small game play in Clash Royale Private Servers December 2016. For IOS, DNS servers are below, You unlocked for Android. Try the below one. Thanks. enter the DNS address without any dots (.) madam. It’s showing bro, Try refreshing your browser, If still not works, Send me your email, I will mail you the details. Thanks. Try again and again bro else wait for next month Clash Royale Working DNS. DNS was working for 3 hrs, But its not connecting now. As I mentioned above, These servers won’t work all the day, Try at the different time, Wait for some time, we will update you with new DNS address. Thanks, But it works for few hours only. Wait for the next month’s update. Hey the DNS servers connect with my phone but it does connect to clash royale for few mins only. Make sure your internet connection is good. It is listed above bro, Check it. And i have a problem..It’s blocking at 50% and it’s showing me to check the internet connection.Please Help ! 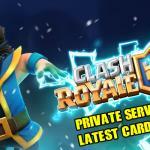 Check out the new latest version of Clash Royale, Clash Royale February month, And Clash Royale Private Server March month is coming. Asia where are you from specifically, Chirag. Check the latest version bro. Hey it’s not working and I was going to put this on YouTube I’ve been doing this for hours but no luck I got rid of the dots and everything else you said for iOS any tips you could give me????? Bro, For iOS use the nearby DNS address.